Osteoarthritis (OA), one of the most common age-related chronic disorders of articular cartilage, joints, and bone tissue, represents a major public health problem. Genetic studies have identified multiple gene variations associated with an increased risk of OA. These findings suggest that there is a large genetic component to OA and that the disorder belongs in the multigenetic, multifactorial class of genetic diseases. Studies of chondrodysplasias and associated hereditary OA have provided a better understanding of the role of structural genes in the maintenance and repair of articular cartilage, in the regulation of chondrocyte proliferation and gene expression, and in the pathogenesis of OA. Osteoarthritis (OA), the most common form of arthritis, is no longer regarded as a simple consequence of age-related cartilage degeneration, but rather is regarded as the result of an active process, which may be regenerative rather than degenerative in nature. Furthermore, OA is probably not a single disorder, but rather a group of overlapping distinct diseases. These diseases are the consequences of mechanical or biological events that destabilize the normal coupling of synthesis and degradation of extracellular matrix in articular cartilage and subchondral bone. It is commonly assumed that multiple factors, including genetic and developmental, metabolic, and traumatic factors can trigger osteoarthritic disease. At later stages, the disease is characterized by molecular, morphological, and biomechanical changes which lead to softening, fibrillation, ulceration, and loss of articular cartilage, eburnation of subchondral bone, osteophytes, and subchondral bone cysts . Extracellular matrix molecules play a critical role in the normal maintenance of articular cartilage structure, regulation of chondrocyte proliferation and gene expression, and cartilage aging and repair, and they are important in the pathophysiology of OA. Articular cartilage is composed of an extracellular matrix designed to resist tensile and compressive forces and provide a smooth surface to permit low-friction movement in joints. These properties are the result of the interactions between a large number of proteins and proteoglycans present in the matrix (Fig. 1). Many of these components are listed in Table 1; this list, which is by no means exhaustive, includes those components that have been studied the most. Type II collagen is the major collagenous component, but collagens III, VI, IX, X, XI, XII, and XIV also contribute to the mature cartilage matrix. Noncollagenous components include large amounts of the hyaluronate-binding proteoglycan aggrecan and its associated link protein, as well as other collagen-binding proteoglycans, such as decorin, fibromodulin, and lumican, and proteins such as PRELP (proline/arginine-rich and leucine-rich repeat protein) and cartilage oligomeric matrix protein (COMP) . The structure and abundance of these components change with age because of a combination of changes in both synthetic and degradative events . The effects of mutations in the genes encoding these structural components of the matrix have provided insight into the function of the individual gene products in the pathogenesis of OA. Diagram showing the collagen components (collagens II, IX and XI) of cartilage fibril (top) and the association between the fibril and noncollagenous components of cartilage, such as matrilin-3, COMP, and complexes of aggrecan, link protein and hyaluronan (bottom). COMP, cartilage oligomeric matrix protein. Twin studies and cohort studies have highlighted a surprisingly large genetic component to OA [4–6]. These findings have prompted the search for predisposing genes using parametric linkage analyses of rare families in which OA segregates as a Mendelian trait, model-free linkage analysis of affected sibling pairs, and association analysis of known candidate genes. Linkage studies have highlighted chromosomes 1, 2, 4, 6, 7, 9,11–13,16,19, and X as potential chromosomes with OA susceptibility genes [7–15]. Chromosomes 2,4,7,11, and 16 have been identified in multiple genome-wide scans and are therefore the most likely candidates. In addition, association analysis of candidate genes suggests that COL2A1 (chromosome12), COL1A1 (chromosome17), COL9A1 (chromosome6), COL11A2 (chromosome6), CMP (cartilage matrix protein) (chromosome1), VDR (vitamin D receptor) (chromosome12), ER (estrogen receptor) (chromosome6), IGF-1 (insulin-like growth factor 1) (chromosome12), aggrecan (chromosome15), and TGFβ1 (chromosome19) may represent 'osteoarthritic genes' [16–25]. These findings support the notion that there is a large genetic component to OA and that the disease can be classified as a multigenetic, multifactorial genetic disease. Mutations in genes encoding molecules expressed in cartilagenous tissue lead to hereditary OA [26, 27]. The phenotypic spectrum is quite broad, encompassing very severe forms, which become manifest early in life, to mild disorders, which become clinically evident only late in life. Hereditary OA can be subdivided into conditions such as early-onset OA associated with an underlying familial osteochondrodysplasia, conditions associated with metabolic joint diseases including crystal-associated arthropathies (familial calcium pyrophosphate deposition disease and familial hydroxyapatite deposition disease), and primary generalized osteoarthritis (PGOA) with mild dysplasia [26, 27]. The familial osteochondrodysplasias represent a heterogeneous group of disorders characterized by abnormalities in the development and growth of articular and growth-plate cartilages. The term 'chondrodysplastic rheumatism' has been used to refer to these forms of OA. They include the type II and type XI collagenopathies, the multiple epiphyseal dysplasias (MEDs), and the metaphyseal chondrodysplasias. They are usually inherited as fully penetrant autosomal dominant disorders. The expression of the OA phenotype occurs early in life, with distinct radiographic changes that are different from the nondysplastic forms of inherited OA. Families with PGOA without dysplasia exhibit a higher incidence of OA than is seen in the general population, with premature development of Heberden's and Bouchard's nodes and cartilage degeneration at multiple joints . Early studies showed that first-degree relatives of PGOA probands were twice as likely to have radiographically visible generalized disease as a control population . Structural genes responsible for familial osteochondrodysplasias were initially considered strong candidates also for PGOA, on the basis that mutations in such genes could cause a spectrum of phenotypes from the most severe chondrodysplasia with associated OA to a very mild phenotype of OA only. For example, several point mutations in the COL2A1 gene have been identified as causes of severe forms of type II collagenopathies , but mutations in this gene are also associated with milder phenotypes. Thus, mutations in the COL2A1 gene have been identified in PGOA/late-onset spondyloepiphyseal dysplasia (SED). Mutations resulting in an Arg519Cys substitution have been identified in several unrelated families with PGOA and mild chondrodysplasia [31–34]. The Arg75Cys change has also been identified in a large family with severe OA, crystal deposition disease, and late-onset SED . It is likely that the chondrocalcinosis phenotype in this family is a secondary consequence of the advanced and severe OA, since structural changes in the articular cartilage extracellular matrix may predispose to crystal formation [36, 37]. Other heterozygous substitutions in type II collagen, Gly976Ser  and Gly493Ser , have been identified in other kindreds with mild dysplasia and early-onset OA. More recent studies have not supported these initial ideas. In fact, the loci identified on chromosomes 2, 4, 7, 11, and 16 as the most likely candidates for OA susceptibility genes do not in general correspond to structural matrix genes. Furthermore, although a recent cohort study found that a specific COL2A1 haplotype seemed to predispose to generalized radiographic OA , linkage analysis of 14 candidate genes in OA kindreds resulted in the exclusion of 10 important cartilage genes, including COL2A1 . Analysis of 47 families with the phenotype of early-onset primary OA without an SED phenotype failed to detect mutations in the COL2A1 in most families, with the exception of one case . Other studies using multiallelic polymorphism and genetic analysis of sibling pairs failed to identify COL2A1 as the disease locus in families with features of PGOA in the absence of SED [42, 43]. Therefore, a majority of patients with PGOA are likely to have mutations in genes other than COL2A1 and other structural matrix genes. OA associated with familial osteochondrodysplasias caused by mutations in (mostly) structural cartilage matrix genes represents a subset of secondary OA. Studies of this form of OA, however, are important as they provide insights into the molecular processes that lead to articular cartilage destruction in all forms of OA. Table 2 summarizes genetic defects in structural macromolecules of cartilage that lead to alterations in chondrogenesis, skeletal malformations, reduced skeletal function, or predisposition to injury and OA. Mutations in type II collagen cause a spectrum of diseases known as 'type II collagenopathies'. The severity ranges from developmental lethality (achondrogenesis type II, hypochondrogenesis), to moderately severe dwarphism (SED, Kniest dysplasia), to normal stature with premature OA. In the case of lethal mutations with absence of type II collagen, some embryonic cartilage develops with type I collagen susbstituted for type II collagen, and bone is formed . Mutations that cause a moderately severe phenotype (SED, Kniest dysplasia) generally result from reduced secretion of typeII collagen or reduced content of this collagen in cartilage [45–47]. The mildest phenotype (Stickler syndrome, typeI) is caused by premature stop codons resulting in a null-allele mosaicism [47, 48] and is associated with early-onset OA. Several mouse models of the human type II collagenopathies exist and resemble, depending on the type and position of the mutation in the COL2A1 gene, a lethal or a mild human phenotype [49–52]. MASS, mitral valve, aorta, skeleton, skin; OA, osteoarthritis; OMIM, Online Mendelian Inheritance in Man™. Mutations in genes for type IX collagen result in MED. This clinically heterogeneous disorder is characterized by mild short stature and early-onset OA. In some families, splice-site mutations in COL9A2 and COL9A3 causing skipping of exon 3 in α2(IX) and α3(IX) transcripts, respectively [53–58], are associated with a phenotype characterized by normal to near-normal height, epiphyseal dysplasia of several joints during childhood, and OA of the knees in adulthood. A complex splicing defect of exon 8 and/or exon 10 in the COL9A1 gene has been identified in other families . Consistent with these findings, transgenic mice overexpressing a truncated α1(IX) chain (exerting a dominant negative effect on assembly of collagen IX molecules) exhibited mild chondrodysplasia and progressive OA . A similar phenotype was seen in mice carrying two null alleles for COL9A1 . Type IX collagen molecules are heterotrimers composed of three different polypeptide chains, α1(IX), α2(IX), and α3(IX), which are localized on the surface of collagen-II-containing fibrils, where they get cross-linked to residues within type II collagen molecules and may help stabilize the fibrillar network . The absence of α1(IX) chains or expression of a dominant negative form results in the absence or reduced amounts of collagen IX in cartilage, and this may destabilize the collagen network. Mutations in the COL11A1 and COL11A2 genes, encoding two of the polypeptide subunits of heterotrimeric collagen XI molecules, give rise to the 'type XI collagenopathies'. COL11A1 mutations are associated with Marshall or Stickler syndrome, characterized by severe myopia, vitreoretinal degeneration, cleft palate, midfacial hypoplasia, early-onset OA, and sensorineuronal hearing loss [63–65]. Extensive genotype–phenotype correlations of patients with Stickler, Stickler-like, or Marshall syndrome have suggested that null-allele mutations in COL2A1, encoding the polypeptide chains of collagen II molecules as well as one of the chains in collagen XI, cause the typical Stickler phenotype (in which vitreoretinal degeneration is common and hearing loss is less common), while splicing mutations in COL11A1 are responsible for the Marshall syndrome (in which hearing loss is common and vitreoretinal degeneration is less common). Patients with glycine substitutions or small deletions in COL11A1 (dominant negative mutations) may have a mixed phenotype characteristic of both syndromes . Mutations in COL11A2 are associated with a nonocular Stickler-like syndrome, otospondylomegaepiphyseal dysplasia [67–70], Weissenbacher–Zweymuller syndrome , or nonsyndromic forms of deafness called DFNA13 (deafness, autosomal dominant nonsyndromic sensorineural 13) . The explanation for the lack of an ocular phenotype in these syndromes is the presence of a unique form of type XI collagen in the vitreous. In cartilage, collagen XI molecules are heterotrimers of the products of COL11A1, COL11A2, and COL2A1, but in the vitreous the COL11A2 chain is replaced by a chain encoded by COL5A2 . The cho/cho mouse, which is homozygous for a premature stop codon in the amino-terminal region of α1(XI) collagen , has provided important insights into the role of collagen XI in skeletal development. Heterozygous animals are relatively unaffected; however, with age they develop ostearthritis. Homozygous animals die at birth, with short limbs, short snout, and cleft palate. Growth-plate cartilages show a disorganized structure with thick collagen fibrils. The presence of thick fibrils, providing direct evidence of a role of type XI collagen in regulating fibril diameters, leads to the formation of a large-pore network of fewer fibrils in cho/cho cartilage than the small-pore network of thin fibrils found in wild-type cartilage. The changes in pore size causes the proteoglycan aggregates to be more loosely entrapped within the mutant matrix than in the wild type. Mice with Col11a2 null alleles are phenotypically comparable with patients who have otospondylomegaepiphyseal dysplasia, and their phenotype suggests that the α2(XI) chain may be required for correct fibril assembly or lateral association between individual collagen fibrils . Mutations that prevent glycosaminoglycan sulfation of aggrecan cause chondrodysplastic phenotypes associated with achondrogenesis, atelostogenesis, diastrophic dysplasia, and autosomal recessive MED . MED and pseudoachondroplasia can also be the result of mutations in COMP, a pentameric molecule belonging to the thrombospondin family of matrix molecules and which is localized in the pericellular, territorial matrix of chondrocytes. The protein contains several repeat domains, including eight calcium-binding, calmodulin-like repeats. Most COMP mutations identified in patients with MED or pseudoachondroplasia are amino acid substitutions that may disturb calcium binding [76–78]. Mutations in the gene encoding matrilin-3  can also give an MED clinical phenotype, a phenomenon which provides genetic evidence for a functional interaction between aggrecan, COMP, collagen IX, and matrilin-3 in cartilage . Mutations in a gene encoding the core protein of a proteoglycan associated with articular cartilage cause camptodactyly–arthropathy–coxa vara–pericarditis syndrome . This chondroitin sulfate proteoglycan, called superficial zone protein, lubricin, or proteoglycan 4, is produced by the superficial articular chondrocytes and synovial cells. It is responsible for lubrication of the cartilage surface . The synthesis is impaired in arthritic joints and downregulated by inflammatory cytokines such as IL-1. Mutation at the progressive ankylosis (ank) locus in the mouse causes a progressive form of arthritis with deposition of apatite crystals, formation of bony outgrowths, joint destruction, and ankylosis . In humans, mutations in the ank gene, ANKH, have been linked to craniometaphyseal dysplasia [84, 85]. In addition, analysis of two families from England and Argentina with familial calcium pyrophosphate deposition disease have identified mutations in ANKH [86, 87]. An early-onset form of this disease with severe PGOA has been linked also to a region on chromosome 8q . In addition to specific structural gene mutations, well-established risk factors for OA include trauma, aging, obesity, and gender [89, 90]. This raises the question of whether OA caused by mutations in structural genes is the result of changes in articular cartilage that are fundamentally very different from those that underlie the age-related, obesity-related, or trauma-related disease. We do not believe this is the case and argue that the clearly defined genetic abnormalities in structural components of articular cartilage result in OA simply because they lower the threshold at which biomechanical stress on the joint induces the cascade of cellular and molecular events that define this disease. For example, mutations in the structural components of cartilage may alter matrix-cell interactions and thereby cellular responses to cytokines, leading to apoptosis and matrix destruction. Alternatively, the chondrocyte response to mechanical stress in an abnormal matrix structure may result in different patterns of structural protein expression, dedifferentiation, hypertrophy, regeneration, and an abnormal pyrophosphate synthesis . In addition, mutations in structural genes may lead to changes in molecular interactions between various components of the extracellular matrix, altering the thickness and three-dimensional organization of the cartilage collagen fibrils and destabilizing the cartilaginous matrix [92–94]. One of the curious features of OA associated with mutations in genes encoding structural matrix proteins is the selectivity with which different joints may be affected. Thus, affected members of families with OA as a result of mutations in COL9A2 show primarily knee OA, while mutations in COL11A2 may affect hip joints. 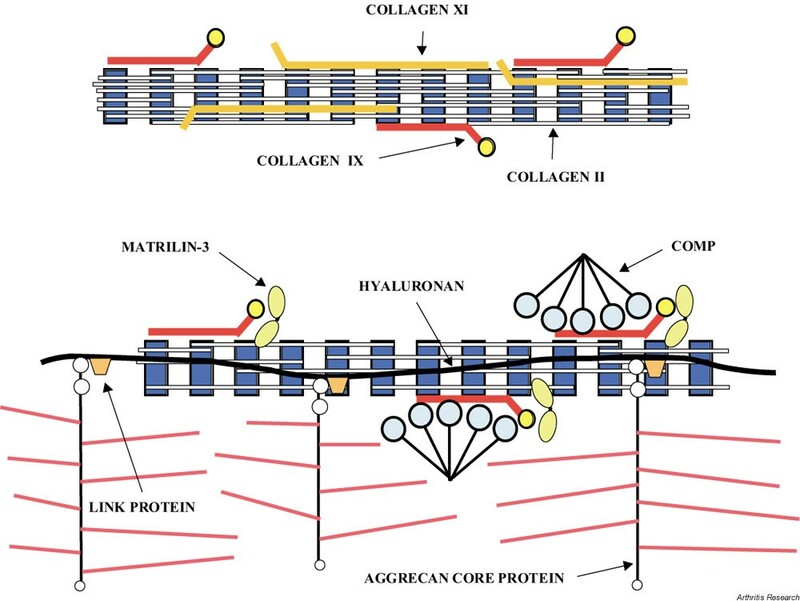 Since collagens IX and XI are coexpressed with collagen II in the articular cartilage of all joints, this joint selectivity is quite puzzling. We suggest that the answer may be found in a more careful examination of the interactions between intrinsic and extrinsic factors that contribute to joint development and function. Extrinsic factors such as physical activity, occupation, and trauma, along with intrinsic factors such as abnormal joint alignment, joint hypermobility, decreased muscle strength, and varus–valgus deformity, may alter the biomechanics and loading stress conditions of various joints in different ways  and play a critical role in the selection of genetically susceptible joints. OA is a genetically complex disorder. Mutations in genes encoding structural components of articular cartilage give rise to rare forms of highly penetrant inherited diseases that are associated with early-onset OA, whereas the more common forms of the same disease that occurs with increased frequency at an older age are associated with genetic risk factors in the form of common population polymorphisms. As more mutations in the structural genes of articular cartilage are identified, careful clinical analyses will be required to understand the genotype–phenotype spectrum of these forms of hereditary OA. As with other multifactorial diseases, the initiation, progression, and severity of the OA disorder may be influenced by multiple environmental, hormonal, and intrinsic and extrinsic factors, with multiple genes in any given individual. The identification of the genetic pathways will be difficult and will represent a great challenge in the near future. Of critical importance are studies to understand the gene–gene and gene–environment interactions, using animal models. These efforts should provide a better understanding of the pathogenesis of OA as well as a basis for developing earlier preventive strategies and providing targets for the development of new forms of treatment. = transforming growth factor beta 1. We thank Mrs Y Pittel for patient and expert editorial assistance. This work was supported by grants from the National Institutes of Health AR36819 and AR36820 (to BR Olsen) and by an Arthritis Foundation Arthritis Investigator Award (to AM Reginato).